A new hominin species arose in Africa about 1.9 Myr ago that showed advances over H. habilis.Thebest specimen, and one of the most complete fossil hominid skeletons yet found (Figure 11.12(a)), was collected in 1984 by Richard Leakey and colleagues on the west side of Lake Turkana, Kenya. The pelvic shape shows that the individual is a male and his teeth show that he was about 12 years old when he died. He stood about 1.6 m tall and had a brain size of 830 cm3. The skull (Figure 11.12(b)) is more primitive than H. sapiens because it still has large eyebrow ridges and a heavy jaw with no clear chin. 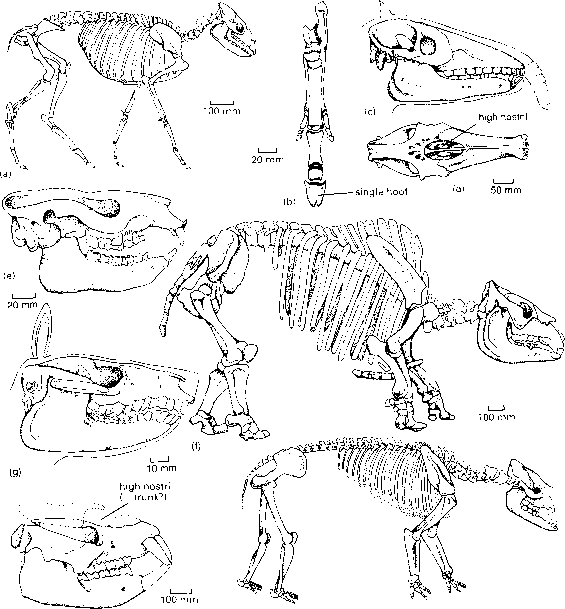 The skeleton seems largely modern and fully bipedal in adaptations. This remarkable early find from Africa was assigned to Homo erectus,but it might more appropriately be retained in a separate primitive species,H. ergaster (Wood and Collard, 1999), and the name H. erectus is used only for younger and more specialized material. This includes fossils from eastern and southern Africa dating from 1.6-0.6 Myr ago, as well as specimens from other parts of the world. 1.8 Myr ago. If these ages are confirmed, it is evident that H. erectus set out from Africa nearer 2 Myr ago than 1 Myr ago. 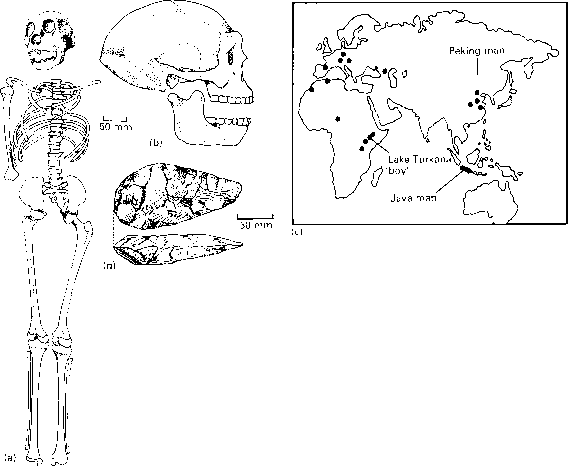 Further the Java H. erectus may have survived until very recently, perhaps 50,000 years ago, hence probably overlapping with the first Homo sapiens to reach the area (Baba et al.,2003). One of the richest sites for H. erectus is the Zhouk-oudian Cave near Beijing in China, the source of over 40 individuals of 'Peking Man'. They were found in cave deposits dating from 0.6 to 0.2 Myr ago and seem to show an increase in mean brain size from 900 to 1100 cm3 during that time. The cave was thought to have provided evidence for a number of major cultural advances, including the use of fire, but the evidence has since been shown to be unreliable. Older evidence for the use of fire by H. erectus is reported from Israel in a site dated as 0.8Myr old (Goren-Inbar et al., 2004). Acheulean industries were often classed together as early Palaeolithic ('Old Stone Age').